While we were staying in Mauritius, we took a stroll down the beach from our hotel, the St Regis, and came across the 5 star Lux Le Morne hotel, which also had a dramatic view of the majestic Le Morne. 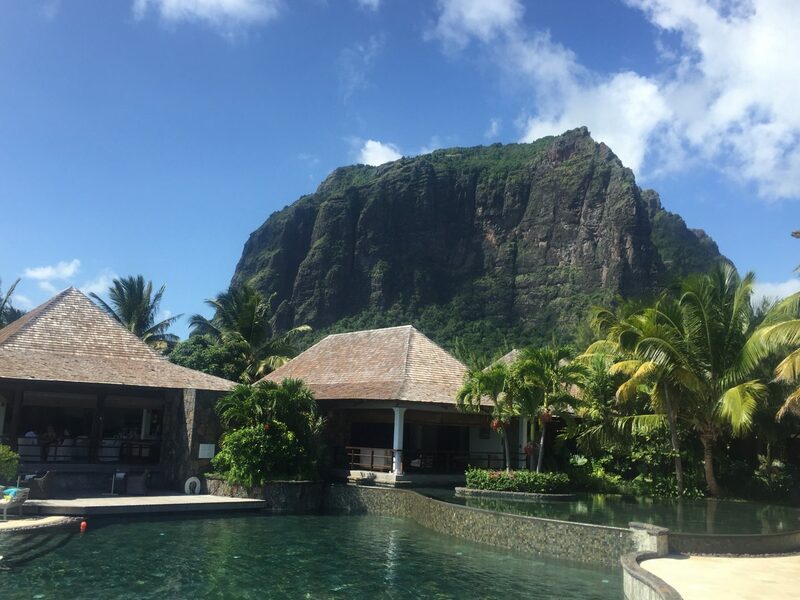 Le Morne is an UNESCO World Heritage site and the location of the hotel is highly privileged as the beach surrounding it has white, powder soft sand and is spectacular. 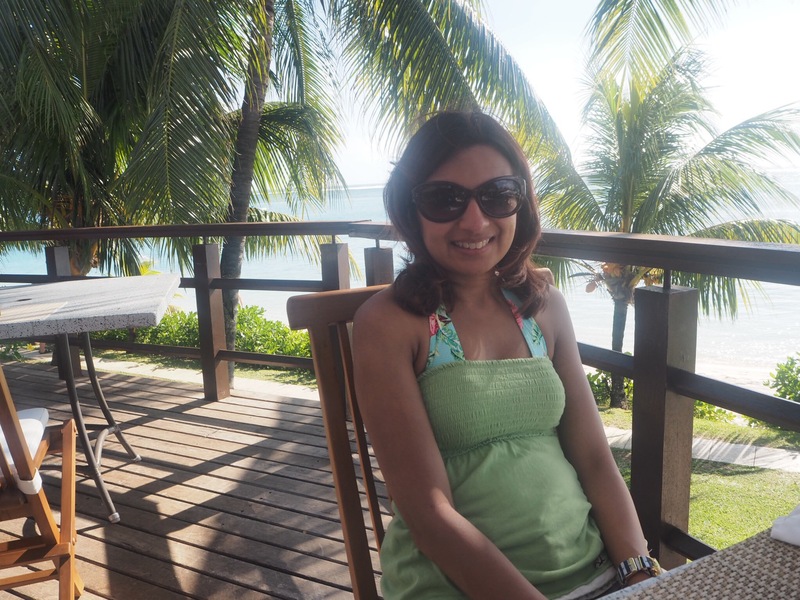 We were feeling peckish so we wandered in and asked if we could have lunch there, as there was a beautiful decking area with a gorgeous view of Le Morne. 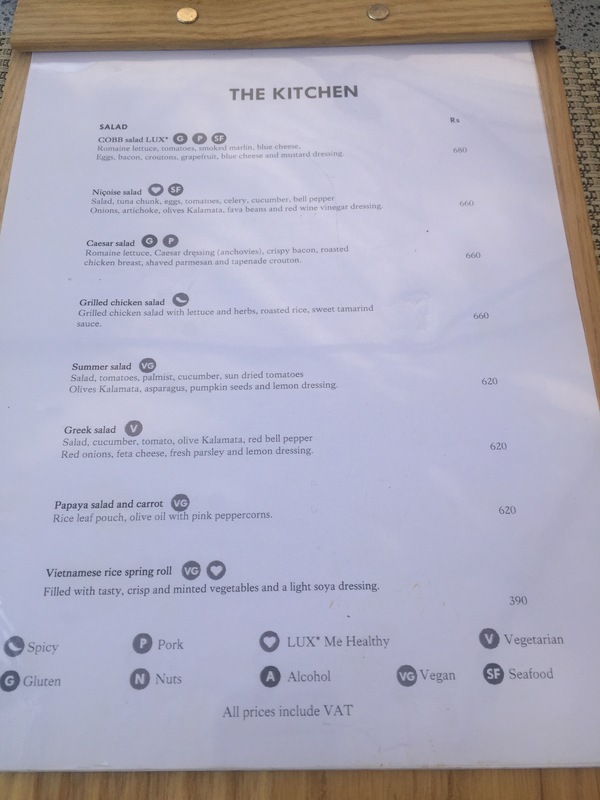 The restaurant was called the Kitchen and is the hotel’s central restaurant. 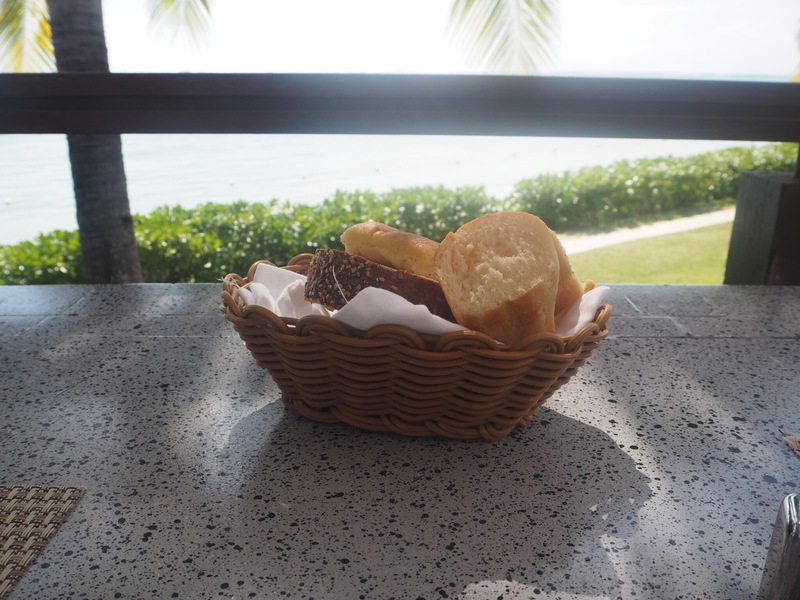 While we decided what to eat, we nibbled on bread that arrived with a choice of dips. 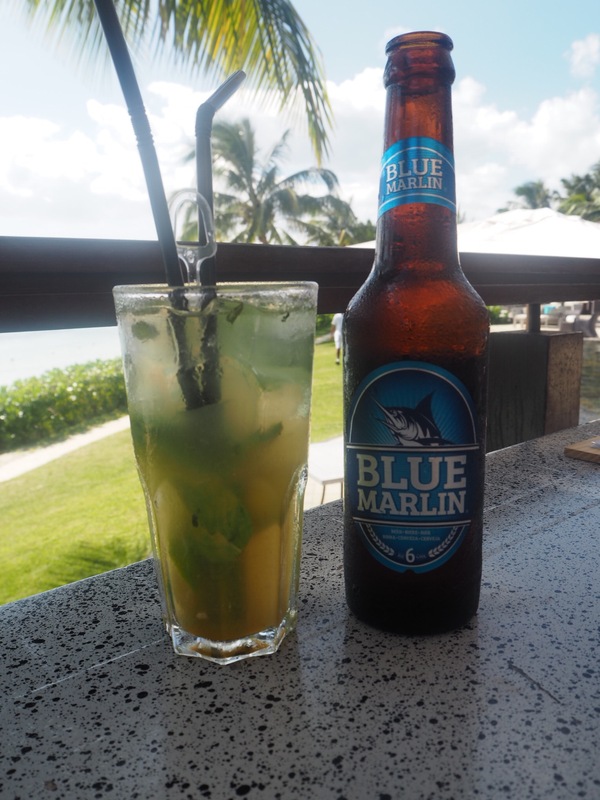 For drinks I went for a Mojito and Amit tried the local beer, Blue Marlin. The Mojito was not the best I have had and was slightly on the strong bitter side. It was still refreshing on a hot day. 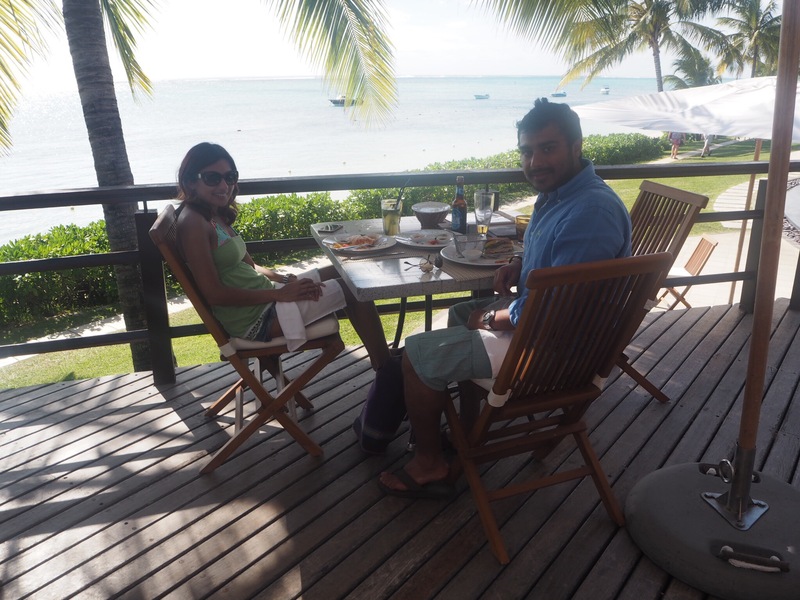 The heat was intense in Mauritius so we opted for lighter dishes for our lunch. 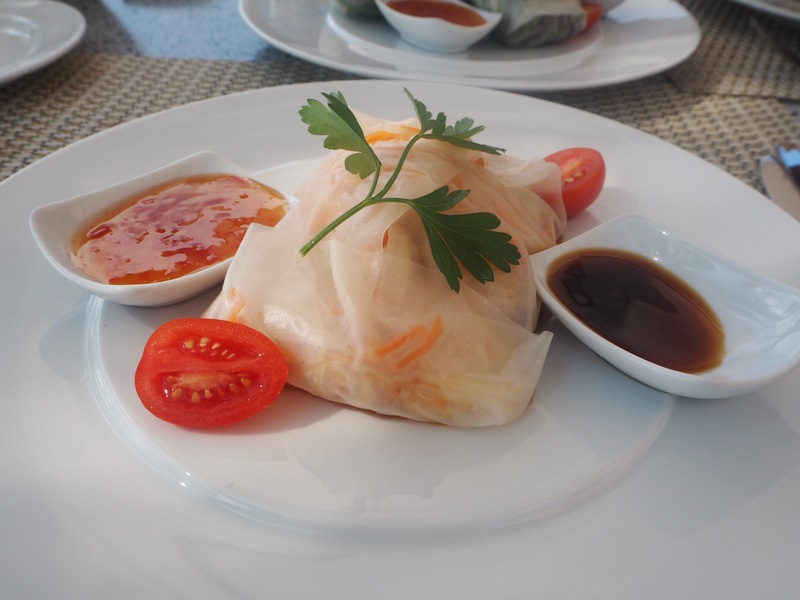 The first one was a Papaya Salad and carrot, which was served inside a rice leaf pouch and drizzled with olive oil and with a pink peppercorn crunch. It was lovely and tangy. 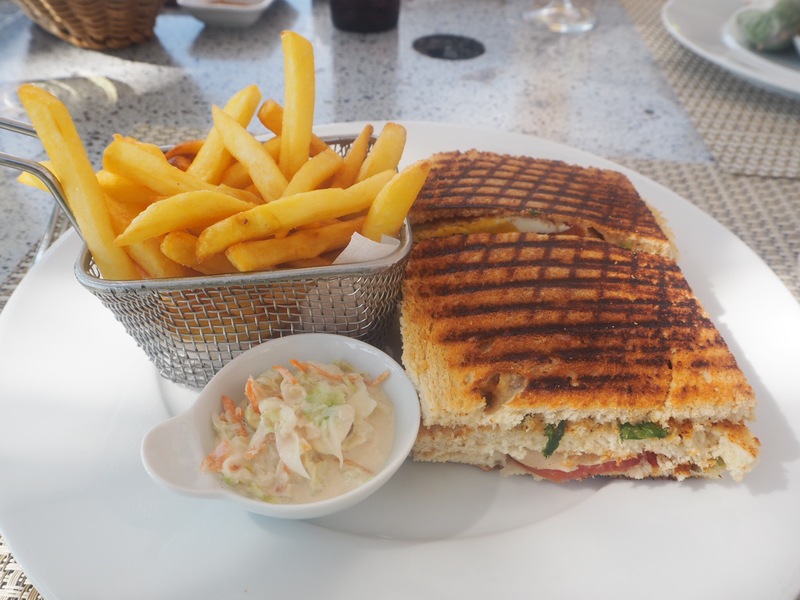 Amit opted for a less lighter option and went for a club sandwich with a side of chips and coleslaw. He loved that everything tasted so fresh and the chips (I stole a few) were amazing. 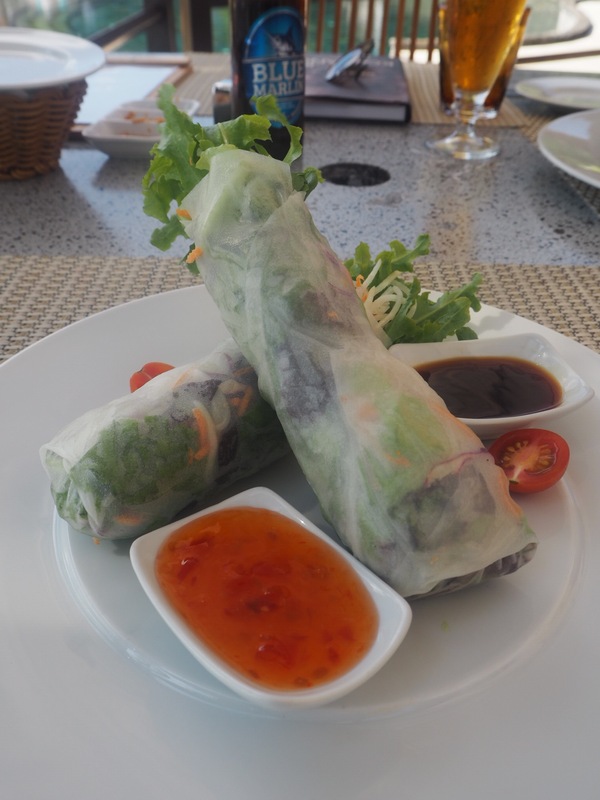 The second of the lighter options was Vietnamese rice spring rolls, which were filled with vegetables and a light soya dressing. It was delish! It was massive too and surprisingly very filling. 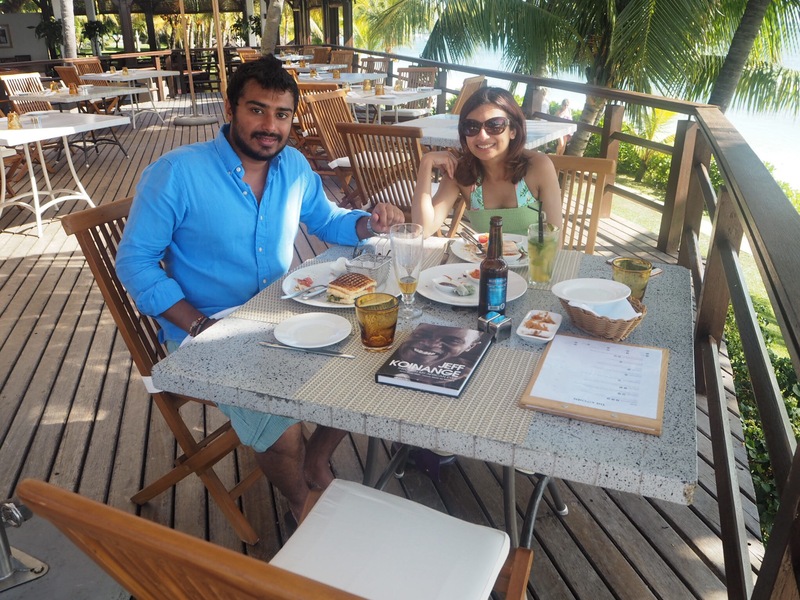 The restaurant location was stunning and we found it to be a lovely relaxing spot to have lunch with the sea breeze and the beautiful view. 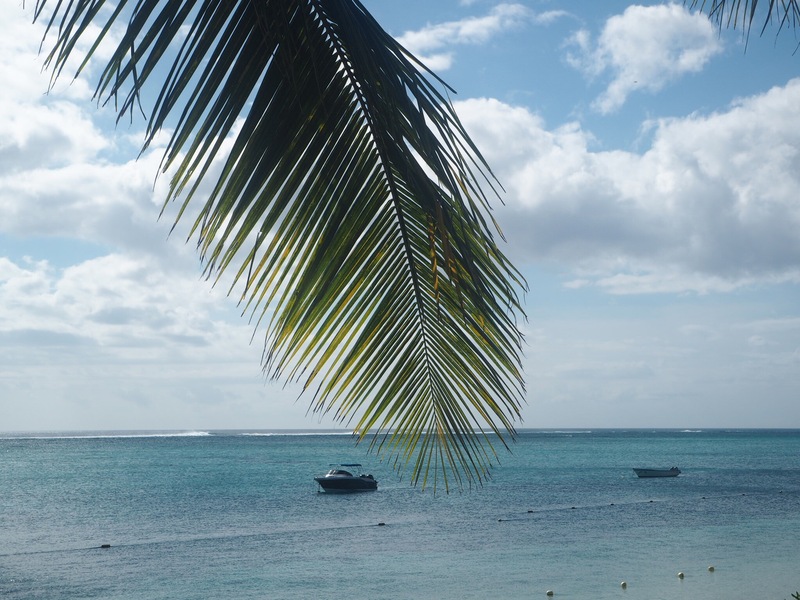 This was our palm fringed view of the sea on one side which was stunning. It is also a dolphin territory but unfortunately we didn’t spot any that day. 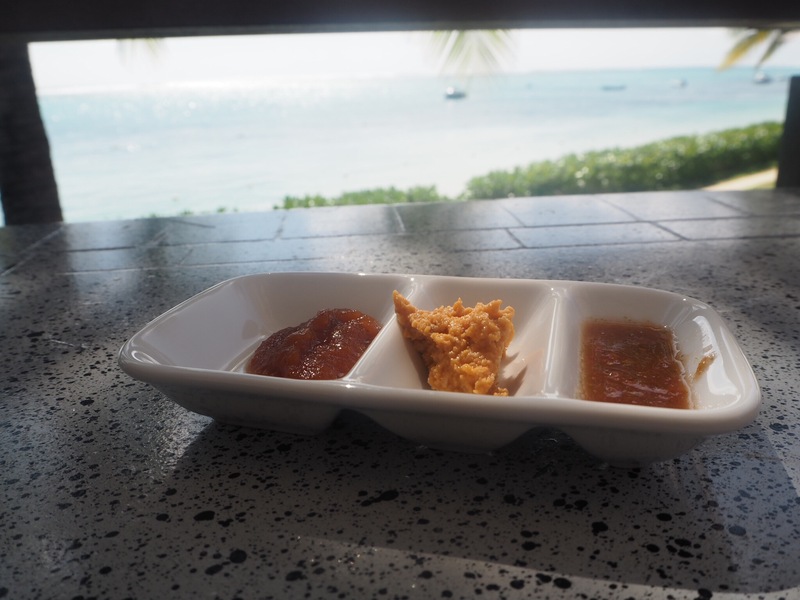 We really enjoyed our lunch and it was nice to try somewhere different so if you are staying around Le Morne during a trip to Mauritius, it is worth checking out the Kitchen at Lux Le Morne. 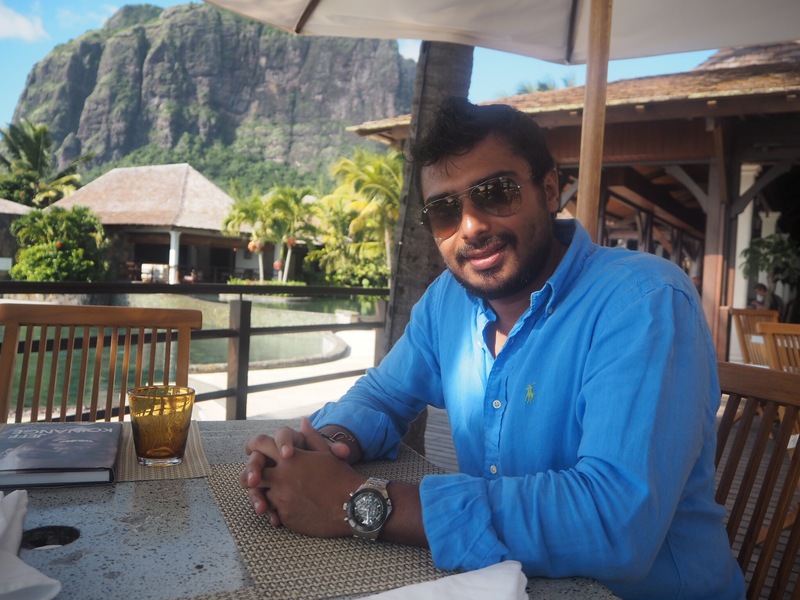 For more information on Lux Le Morne click here.